Hrongar is a Nord warrior who serves as an advisor and courtier for his brother Balgruuf the Greater, the Jarl of Whiterun. If not currently exiled by the Stormcloaks, he may greet you by saying: "All this standing around is rubbish. We should be taking the fight to the Stormcloaks." or "I'm not a man, I'm a weapon in human form. Just unsheathe me, and point me at the enemy." If Adrianne Avenicci is still alive, Hrongar may also greet you by saying: "My brother takes council from Proventus Avenicci? What a laugh. He takes council from his daughter, and she's a bloody blacksmith." He resides at Dragonsreach initially, and so long as Balgruuf remains jarl. 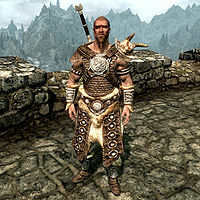 Hrongar wears a set of scaled horn armor with matching pairs of bracers and boots. He is equipped with an iron greatsword, and carries a selection of common loot and gold. During the quest Dragon Rising, Hrongar will express confidence in you as the Dragonborn, in contrast to Proventus Avenicci, the jarl's steward, who is initially suspicious and skeptical of you. Hrongar was set to replace Balgruuf when the latter is killed by his children during The Whispering Door. However, this part of the quest was not implemented in the final game, so it never happens. As Balgruuf's intended successor, Hrongar has dialogue recorded for all of the quests Balgruuf is involved in to act as his replacement, and Adrianne Avenicci's husband, Ulfberth War-Bear, also has unused dialogue describing him as "a hot-blooded war-monger" of a jarl with a dungeon "filled with folk who roused his temper". This page was last modified on 16 April 2018, at 04:44.